For the last race at Antigua Sailing Week our team pulled out the stops. We loosened the guard rails so we could hike out further. And to help with speed we removed about one tonne of weight, including our luggage, two life rafts, extra sails and tool boxes. Aside from a couple who, for reasons that thoroughly escape me, opted to wash the decks with mop and bucket as we approached the start line, everyone on our team was focused. The race lasted about four hours, and during that time incredibly, we were in the lead. We hiked out. Our moves were synchronized. We were headed towards becoming the classic underdog screeching out from nowhere and taking the win. But, at the last moment we jibed too late and watched two boats, SV Spirit and SV Dharma cross the finish line ahead of us. Sitting in the cockpit, I saw one on my team mates become still and expressionless. Her disappointment was palpable. Like me, she was one hundred percent committed to the race. To see the win falling away before our eyes was hard to fathom. But, our effort was not for naught. We came in third place again yesterday, and secured ourselves a third place spot overall for our class in the regatta. This meant we got to go on stage with elite sailors, people who have spent years with their teams, to accept our award – a bottle of rum, a silver cup, and a silver sailboat – from the Governor General of Antigua, Sir Rodney Williams. It was fantastic. Team SV Spirit of Juno at the final awards night prize giving. Skipper Tony McBride is hoisted by the crew. Our skipper, Tony McBride and Ebbe, our Swedish first mate should be commended for bringing our motley crew of sailors of mixed abilities and personalities to this level of sailing in just one week. We spent the rest of the evening dancing. The skipper of SV Spirit danced on the table, as members of our team danced on chairs around him, glistening in the evening heat of Antigua. 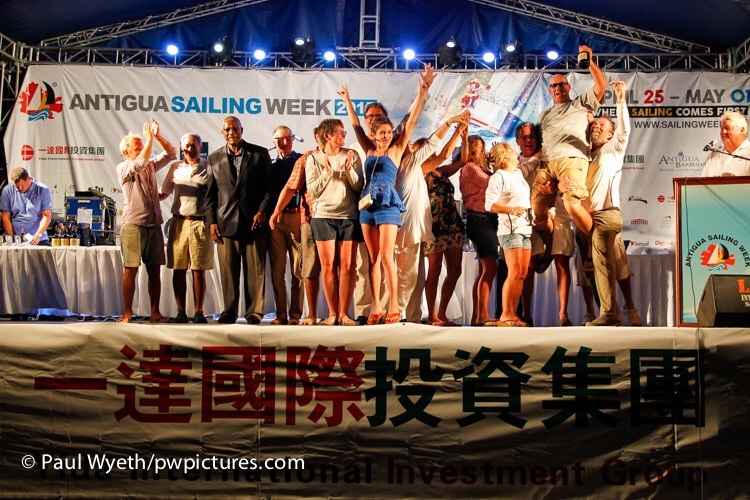 It was a perfect end to a wonderful time at Antigua Sailing Week. Previous Antigua Sailing Week – last day!